Summary: Learn how to plumb in a washing machine, connect washing machine pipes and connect a washing machine to a waste pipe. If possible, install your washing machine next to the sink where the pipes are more accessible. Otherwise you will have to extend the supply pipes, involving much more work. 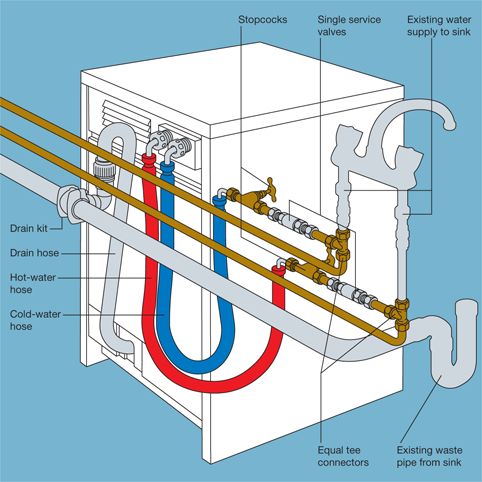 If you are installing an appliance for the first time, you will need to fit a check valve (non-return valve) to the hot and cold pipes connected to the hoses. 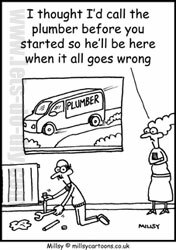 When buying your drain kit, check with the manufacturer's recommendations that it is compatible. Drill holes through the side of the unit accommodating the sink to allow the appliance's hoses to feed through and connect to the pipes. Turn off the hot and cold water supply to the kitchen. 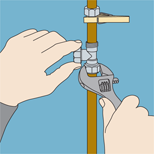 You need to fit Tee valves into the supply pipes at a suitable height for connecting to the appliance. Make two marks 20mm (4/5 in) apart on the cold water supply pipe. Repeat this process on the hot water supply pipe. Then using a pipe slice or hacksaw cut squarely through the pipes. It is best to cut at the lower mark first. When the sections of pipes have been removed file the end of the pipes smooth. Slip the capnuts and olives of the T-valves onto the pipes. To prevent the capnuts and olives slipping off the upper lengths of pipe, attach a spring-clip clothes peg to the pipes. Insert the Tee valve into each of the cut out sections. Using a spanner or wrench tighten the collars which grip the olives, but do not over-tighten. Once the Tee valves are connected to both ends of the supply pipes, a small length of pipe can be fitted to the remaining Tee valve opening, which in turn will be connected to a check valve. Valves with colour-coded taps for hot and cold supply pipes can now be fitted into the check valves. The colour-coded taps should point towards the appliance. Feed the washing machine's hoses through the holes you have made in the side of sink unit and, after checking the black rubber washer is inside the plastic nut of the hose, screw them onto the appropriate valves. The other ends of the hoses can now be attached to the appliance. Turn on the water and check for leaks. Using a spanner or wrench tighten the collars which grip the olives, but do not over-tighten. If a washing machine has not been fitted before, you will now need to connect the waste pipe from the washing machine to the existing waste pipe from the sink. Remove the saddle from the drain kit and clamp it around the existing waste pipe, ensuring it is clear of any joints and the trap. The cutting tool supplied with the drain kit can then be screwed into the saddle to cut a hole in the existing waste pipe. When the hole has been cut remove the cutting tool. The other part of the drain kit can then be screwed into place. The drain kit will be fitted with a non-return valve to stop wastewater from the sink entering the washing machine. Finally, place the machine's waste hose over the nozzle and secure it with a hose clip and you've successfully plumbed-in your washing machine. Waste fittings are available with two nozzles to take a dishwasher as well and can also be fitted to a double sink.